WHAT DOES PAUL MEAN BY COMPARING ADAM AND CHRIST IN ROMANS 5? In today's blog, I'm asking you to imagine Paul's world and this whole idea of moving from Adam's world to Christ's world. Romans is not an easy letter to read through, whether you're listening to it ... It's not easy to preach, and I know it's not easy sometimes to listen and get through this, but really, I think we've made Paul's letter harder in the past than it has to be. And so I want us just to go back to a metaphor that he uses, which is moving from the world of Adam to the world of Christ by imagining Paul's world and why he is making this comparison between Adam's and Christ's worlds. Romans was a letter written to people in Rome, real people, written by a real man, Paul. Paul hadn't been to Rome yet. He didn't start the church in Rome. It started after Pentecost at some time, but he wrote this letter because he believed Rome was a strategic place, because as he said in Romans 15, "It has always been my ambition to preach the gospel where Jesus was not known." Rome was a strategic place, and I remember going to Rome as a college student. I was there with 40 other college students. We went to Rome. We walked a very famous road that goes from Rome to the seaport, called the Via Appia Antica, the Appian Way. I remember walking that road, and I want that to be a way into Romans as we think about what it means to move from the world of Adam of the world of Christ, because that's what Paul was trying to do, was he wanted to help people move from this world and thinking like the world of Adam to the world of Jesus. And what is that experience? 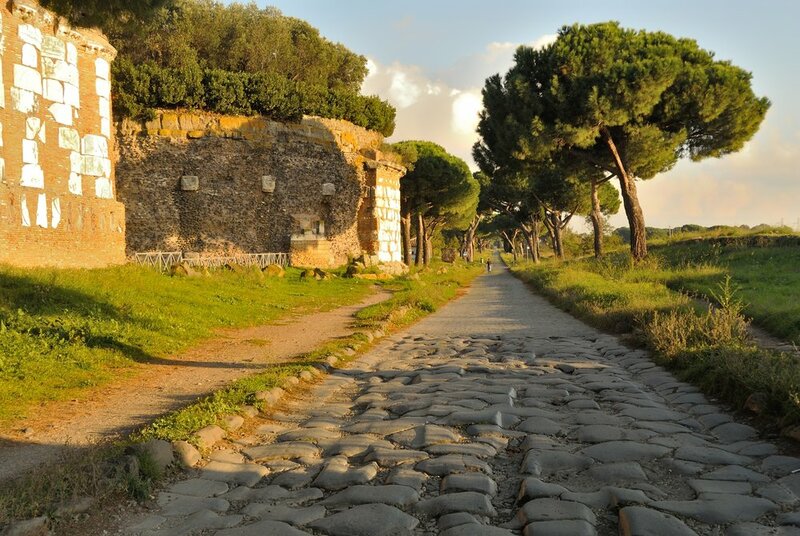 And so we were on this road that Paul, when he finally came to Rome to appeal to Caesar, and it's recorded in Acts he would have walked this Appian Way that's pictured in this blog, from the seaport, years later after writing Romans. And as John and I and the other college students were going through Rome and the Forum, between eating pizza and gelato, we walked through the ancient ruins of Rome. We had to use our imaginations, and that's what I'm asking you to do, is to use your imagination to imagine this world of Paul. And we had to use our imagination to sort of reconstruct the columns and the buildings, the temples, the Agora, the market, the Pantheon, the polytheistic temple. As we walked through the ruins of the Roman forum, pictured in this blog, we began to get a sense for the world Paul was writing to Romans, and that's what I am requesting you to do. I got a letter from my daughter, Anna, from college, and what would happen if I just read part of that letter and then kind of put it aside till tomorrow and read some more of it next week? You'd think, "Man, you're not a very good dad, are you?" No, I read the letter. I read the whole thing and I read it again. In the same way, we need to read Romans as one letter, a whole argument and stay with it. Another example of how to read Romans is to imagine a one sided phone conversation. We hear one half of a phone conversation, and we play that game where we try to see who the person is talking to by their tone of voice, but we can't really hear the other side of the phone conversation. That's what it's like reading a letter in this letter to Romans. Like the one sided phone conversation, we have to connect the background of the letter together from the pieces that we have. If you want to review Romans 1-4, see this post. Just as Paul begins chipping away at those old identity markers of Jew and Gentile and the dividers, by showing that all are united in sin, so he also plants a new identity markers in our union with Christ, that Jews and Gentiles and all of us share. So here, Paul begins in chapter 5 to show what it means to move from the world of Adam to a new humanity in Christ, created through Jesus and life in the Spirit. Now in Romans 5, Paul is saying this is the result of justification. This is what happens when God puts people right, both Jews and Gentiles. What's the first thing you see when you started reading? What's the very first word that comes to your mind? It even refers back to a Jewish, Hebrew word in the first couple of verses that immediately, Paul out of the gate says we have because of all this? Okay, now we have a weight of your sufferings too. Paul is talking about human suffering. He's talking about a normal thing that went on in the ancient world and today, so what do we have in view of our sufferings? Kind of go through that list, going from suffering down to what? Hope. I love how that progression goes. We suffer. That suffering produces what? Character. And character leads to what? It's not like we just grab hope from nothing. This whole process of being saved and being justified, of being made right is a process and we even suffer just as Christ suffered. If Christ suffered and we follow Christ, we're going to be following a way of the cross. There's going to be suffering, but that leads to all those things to hope. It's beautiful. Well I love what Paul says in Rom 5:5: God's love poured into our hearts through the Holy Spirit that has been given to us. It's an image of pouring in to our hearts. We talk about pouring into one another. Pouring our lives into each other, and that love. "We talked about the idea that you can just kind of see the, regardless of how you feel about word original sin or anything like that, you see the natural consequences of sin. We're born into a world where people have sin and gone wrong and therefore, things get messed up. We're born into that and we're all affected by that in one sort of way, whether it's the way we think or our circumstances, and that other people are affected by that too. We don't all come into the world on this equal playing field. Then Jesus came to bring life, and so part of our mission is to put things right to the way they should be, even though a lot of people have experienced the natural consequences of sin, which is death and this, and just like this inequality and racism and messed up power structures, things like that. Yeah, but we're still in the world so we try to be part of bringing that redemption of Christ into the world." This is a little sketch that's been in my bible for years. One of the Professors for my Master of Divinity, Dr. James Walters, began talking about this in Romans in the 1990s, and this model helped me to think about how we live in this world. It's a world where Christ has come. Christ has come to redeem the world, through the crucifixion and resurrection of Jesus, and yet, we're still here. That sometimes confuses us and makes us wonder, Why didn't Jesus make it all right? Why didn't he just fix it completely, right now. Carl Lolar led us in a song in church, "Jesus will fix it, after a while." This "after a while" is the "not yet" in the diagram, the already and not yet. We're in the already redemption of the world, but we are waiting for the not yet coming of Jesus to make all things right and new. There's an already-ness of our lives. Jesus has come. He's redeemed us through the cross and the resurrection. He's brought life. He's brought the life of the Spirit in. That's what Paul's referring to. So we're here in this place. We're a part of Adam, Jews, Gentiles, us, everybody. That's the moment of the cross and the resurrection. Through the life of the Spirit and Paul's getting ready to say it in Romans, and through this image of following Jesus into death and then resurrection, through this image of baptism, through this ritual, through this symbol, we are joining Jesus in life in Christ. We enter into this world where it's kind of like the shape of a football here, or kind of a fish without the tail. That shape right there, that's where we live. We're in this world of the already, but we're stepping in to the next world of the not yet. We get to experience life in the Spirit right now, but it's not over. When Jesus returns, it's going to be consummated. The new heaven and the new earth is going to be remade, and that's what we live for. We live now to start bringing that already, the not yet into the already, and to start looking for injustices and to start looking for things that need to be made right that are wrong. That's why we do the good things that we do. We don't do it, like Paul said, in order to be righteous because of our good works. We do it because of gratitude and the wonderment and mystery of the gospel, that we can be a part of this, that God allows us to be partners with them. He doesn't need us, but he loves to be with us. I think that's a beautiful image, that he just loves to be with us, and he loves to be partners with us. He always has loved partnering with his people. This world of Christ that is to come has broken into the world, and we get to be a part of it right now, in this already and not yet position. Any questions about that model, because that's really important stuff. Paul says in 1 Cor 15:22: "For as all die in Adam, so all will be made alive in Christ." I love that verse. It's one that I like to read at funerals. We all share in the human sickness of Adam, but in Christ we find the antidote for life, transformed now in the era we live in. This great term we call the already and not yet, where we get first taste of heaven on earth, but await being fully engulfed in God's eternal life. Now I want to make this a little more real to us in terms of story of today. Because that life in Christ didn't just happen then. Jesus, through his, the power of the Holy Spirit has entered into the world, entered into us, and when we step into his life, we're taking a step out of the world of Adam, into the world of Jesus. When we follow the life of the Spirit, when we enter into baptism, when we say, Jesus I believe in you. By faith, like Abraham's faith, I believe in you. I want to take a step with you. We continue to take those step into the world of Christ. Here's another way to think about it. The ongoing life that keeps entering the world, the Spirit of Christ entering the world of Adam is like what Eugene Peterson calls "Christ plays in 1000 places," because it keeps happening. Christ keeps entering into our world, breaking in when we thought it was all over, and we experienced all the Christ and all the holiness and spirituality and love that we could possibly muster and then something goes wrong in our life. Something goes south, and then we realize we still need Jesus to break in once again. There's people that are our neighbors, our coworkers, that we need Christ to break into this world of Adam. So I look at, I look at a lot of different ways that Christ breaks into our world. He breaks in at our work and in your homes and in with your neighbors. I watch a football show called "The Football Life." It's one of my favorite shows, and I wonder if you watch it too? My wife, Jill, watches with me and loves it. Carl Lolar and Nate Donley watch it. Every hour of "A Football Life" is a gospel story about a football player who's grown up and they go to his early life and some tragedies and then he rises to fame and then there's stuff that happens and things go wrong but somehow grace and love meet this football player. There was a story I watched recently about Curtis Martin, and all he wanted to do was share his faith. That's why he played football, to share his faith in Jesus Christ. The whole story is so good that I wish you would just go watch that show because he longed for, to love his father who did not love him. It's the anti-gospel of rejection and the gospel of loving merciful acceptance of God. Curtis longed for his mother, who was beaten by his father and left the family, to forgive his father, and at the end of that time, of the show, she finally does forgive her abusive husband. That's the world of Christ entering the world of Adam. Then, I want to show you a three minute video by Steve Hartman of another story of how the world of Christ continues to enter into the world of Adam, keeps breaking into our world in unexpected, weird places. So I want you to watch this video. This story by Steve Hartman about how Christ breaks into the world of Adam. This one takes place in a bar. Watch this. The bartender called on the best tool of all, the compassion within. To me, that story tells about the world of Christ entering into the world of Adam, into the heart of that bartender, and some of you heard words that were in that story. You wondered about images. You wondered why that "bar attender" had her ring in her wallet, right? Some of you, that passed over you. Some of you wondered about a man and his fiancé and having a baby and living together, and yet those are the people that took in that homeless young man who stole the wallet. And so we tend to judge the world of Adam, even as people who in the world of Christ we hear a story like that and we want to judge the world of Adam, while Christ himself is entering that world. He doesn't need us to judge it. He needs us to seek out where he is coming in and join with him. The way that we join with Jesus symbolically is through a moment that we're about to experience together. It's through a moment of joining in this story of death to life because if we're people who have joined in Christ's death, we also join him in resurrection, and we start to become resurrection people who look for those resurrection places where Jesus is breaking into the world of Adam. We start to be people of the already and not yet who believe that there is a new world coming, a new world coming. We can't wait but we do anyway with joy on the journey.